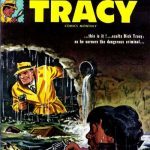 Arcs & Runs #52. 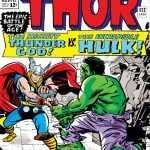 Our month-long celebration of Jack “King” Kirby’s 100th birthday continues in Arcs & Runs with a look at another one of Kirby’s long running characters the Mighty Thor. Thor has always been one of my favourite characters and the time frame we are going to review today lands right in the middle of my own childhood reading period. 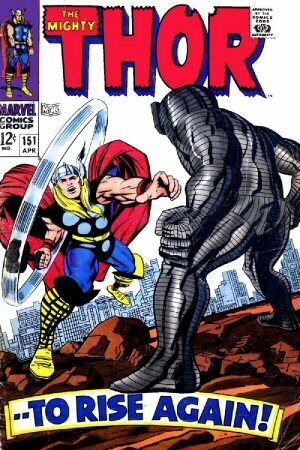 You couldn’t have a better artist prodding your imagination than Jack Kirby and the magical world of Thor. 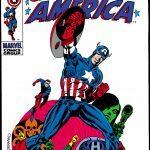 We also double your pleasure with this run as the back-up stories feature another one of Jack Kirby’s fantastic creations the Inhumans. 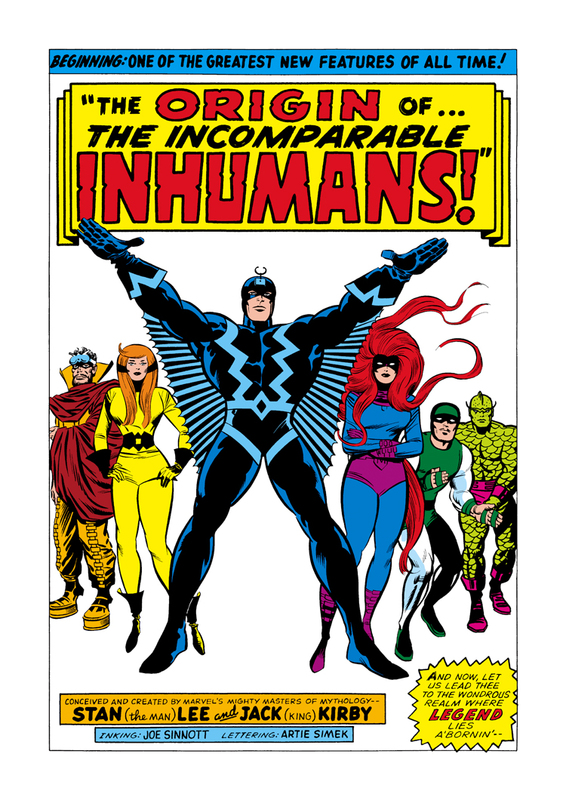 The Inhumans had just recently jumped on to the Marvel scene in the pages of the Fantastic Four, and everyone wanted to know more about them. Origin details of the Inhumans are presented in the backup stories of issues #146-152. Thor’s popularity right now is about has high as I can ever remember it. Thor’s movie appearances in the Avengers and his own movies has raised his profile immensely. I’m really stoked for the next movie in November. Thor’s first comic appearance in Journey in to Mystery #83 is solidly entrenched in 6th place in Overstreet’s Top 50 most valuable Silver age comics. We are reviewing eight books today so the synopsis will be brief. 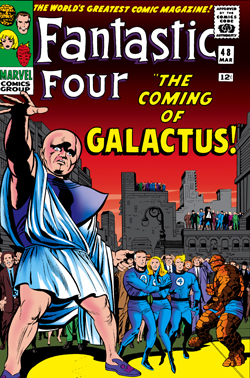 Jack Kirby has his pencils at the ready, Vince Colletta has the inking chores, and Stan Lee is our trusty wordsmith. And awaaay we go. Our story begins in typical Thor fashion. 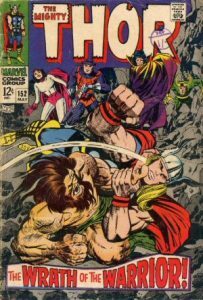 A battle which began last issue concludes early in this issue with Sif, Balder and Thor defeating two enchanters. Odin teleports them to Asgard and orders the three valiant warriors home. Sif and Balder comply, but Thor for “earthly” reasons, refuses to return. Odin gets angry (again) and decides to punish Thor (again), this time by stripping him of all his powers except his strength. 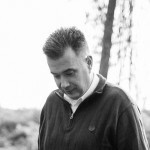 A very demanding father – there is no pleasing this guy. The back-up story in this issue is the final Tales of Asgard episode. This long-running back-up feature began away back in Journey in to Mystery #97 and will replaced next issue with Origins of the Inhumans. Thor continues working with the Ringmasters circus oblivious to the danger he represents. Princess Python has taken a shine to Thor and all seems well in Thor’s new life. He see’s his old girl friend and love Jane Foster on a date at the circus and is happy to see she has moved on. 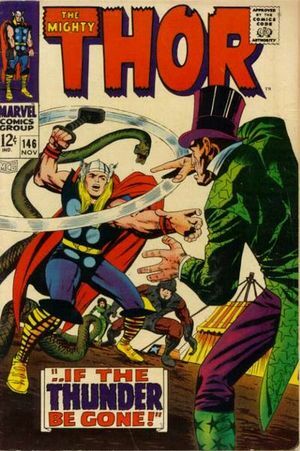 The Ringmaster hatches his plan to rob a golden statue using a hypnotized Thor. The plan goes awry with the police breaking in on the attempted robbery and Thor is caught between the Princess Python being trapped under the gold statue and police gunfire. The story continues next issue. The Inhumans story begins many years in the past with Randac entering the Terragon Mists of Attilian to discover its secrets. Really cool splash page with the current Inhumans to begin the story. Thor is arrested by the police for his part in the robbery, while the Ringmaster and his Circus of Crime make good their escape. Thor has no memory of past events and is put in a cell by the police. Meanwhile in Asgard, Odin has been watching current events. He summons the previously banished Loki back to Asgard. Sif and Balder who have also ben watching their friend, beg Odin to return Thor’s powers. Odin says nay he hasn’t suffered enough. Loki overhears this and quickly hatches a plan to destroy his hated half brother. Loki heads to earth and posts bail for Thor. Once they are out of jail a battle quickly begins. Thor is no match for Loki in this powerless state, and Loki loving every minute of it, pounds Thor mercilessly. Balder and Sif intervene before Loki can finish Thor. Odin is still watching and is incensed. He sends a mystical bolt of energy to earth. I don’t what that is but I think it is going to hurt. 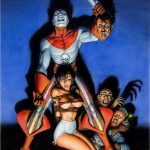 We will find out next issue as the story continues. In the Inhumans story, Kree Sentry #459 (see Fantastic Four #64) has arrived at Attila at just about the time Randac has emerged from the Terragon Mists with new fantastic powers. He encourages all to enter the mists to see for themselves. The Kree Sentry leaves with a warning that his next visit may not be so peaceful if the new-found powers are abused. This story adds to the Kree/Inhuman connection first detailed in the pages of the Fantastic Four. Let there be … Chaos! Odin’s mystical bolt of energy has deprived Loki, Balder, and Sif of their godly powers. Loki knows his tactical advantage is gone and he escapes. Thor, Balder and Sif head to office of Doctor Blake, order some takeout and start watching TV. Hey it’s not so bad being powerless. We switch scenes to small time criminal – the Wrecker. He is busy robbing people with minimal success. His life is about to take a huge U-turn. Meanwhile Loki has found an apartment and is attempting to contact the Norn-Queen Karnilla to ask her to restore his powers. 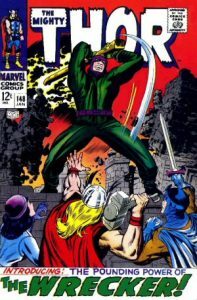 A short time later the Wrecker shows up at Loki’s apartment and he clunks the helmet less head of Loki with his crowbar. The Wrecker finds only Loki’s helmet which he puts on, at just the time Karnilla arrives to grant Loki his wish. She does not recognize that it is not Loki (very close friends), but the Wrecker and she bestows the power to him. When Loki awakes he demands the Wrecker return his power. 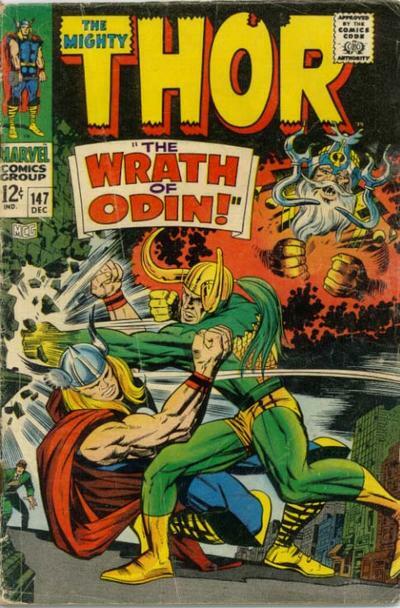 The Wrecker points his crowbar at Loki and sends him back to Asgard. Stan Lee was writing this one for gullible 9-year old’s. While watching TV Thor, Balder, and Sif see a news flash about a super-powered being trashing the city. They set off to try and stop him. Once the battle begins, the Wrecker points his crowbar at Balder and Sif returning them to Asgard as well. The Wrecker wants no interference in his battle with Thor. Continued next issue. The early beginnings of Black Bolt are told in the continuing Inhuman story. 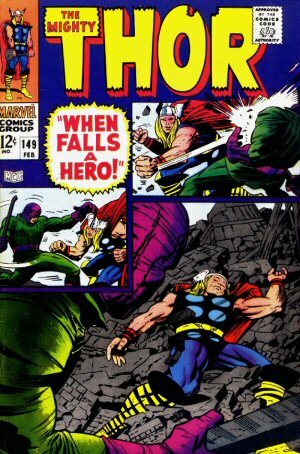 Thor begins his battle with the wrecker who quickly puts him down for the count and heads off to rob a bank. Balder and Sif are distraught and go to see Odin. They explain Thor’s life is in real danger. Odin wants to see this for himself. The mystic crystal is gone, stolen by Loki to prevent Odin from seeing Thor’s predicament. Balder and Sif head to the land of the Norn queen to retrieve the mystic crystal. Where the hell is the “all-seeing” eye of Odin when you need it. 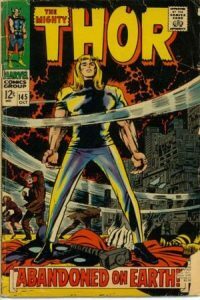 Meanwhile back on earth Thor has revived, stopped by the Baxter building to fight the Thing (see Fantastic Four #73) and is now set to resume his battle with the Wrecker. Thor battles valiantly and even seems to be getting the upper hand when the Wrecker collapses a building on top of him. The Wrecker finds what appears to be the lifeless body of Thor and leaves. The story is continued next issue. 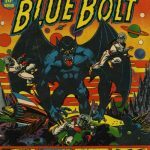 Black Bolt’s story continues and we meet a young Medusa, Gorgon, Karnak, Maximus, and baby Crystal. 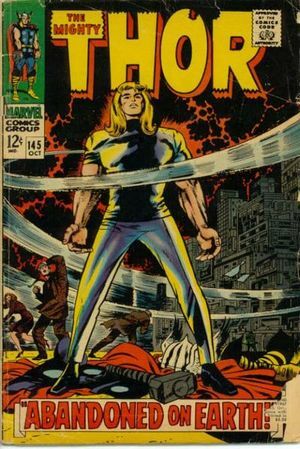 Around the school yard there was a lot of talk that Thor was being cancelled at issue #150. I don’t know where the rumour started but I brushed it off as nonsense all the while worrying it might happen. 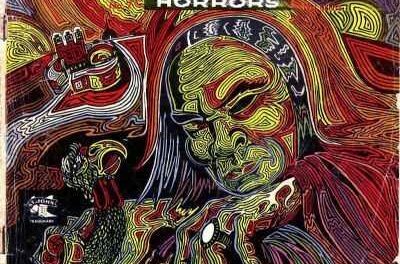 My worst fears seemed to come true when I picked up issue #150 at the bus station and looked at the cover. Thor looked dead. Hela the Goddess of Death thought so too and she was there to claim Thor’s soul with her death touch. 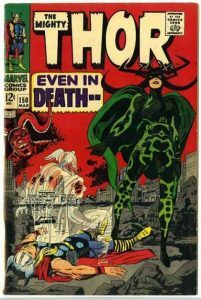 Thor’s astral form tells Hela he is not ready to die. Meanwhile Balder and Sif have made their way to Karnilla’s castle. Both are captured. Sif is shown Thor’s hopeless plight. Karnilla offers the all-powerful Destroyer armour to Sif. She must place her soul in it to activate the armour. Karnilla knows the armour is predisposed to killing gods and if Thor somehow survives the Destroyer will finish the job. Thor has returned to his body with even a little more strength than he thought he had. He goes to confront the Wrecker one more time but the Destroyer arrives and lays out the Wrecker. Thor seeing his most deadly enemies’ arrival prepares for another battle as this issue comes to an end. In the Inhumans a new three-part story featuring Triton begins. Thor attacks the Destroyer while Sif battles the Destroyers armour from the inside trying to get it to hold back from killing Thor. Karnilla has allowed the captured Balder to witness the battle between his two best friends when Ulik the Rock Troll arrives and announces he is going to kill them all. Odin has had a new mystic crystal made and he sees the Destroyer battling Thor. He immediately restores Thor’s power. Thor ‘s hammer returns and Thor steps up his attack on the Destroyer, so much so that Sif loses complete control of the armour and the dreaded disintegrator visor opens ready to fire. Meanwhile back in the land of the Norns, Balder has agreed to be Karnilla’s champion against Ulik in exchange for his and Sif’s freedom. The disintegrator ray misses, but there is more to come. To be continued next issue. Thor’s battle with the Destroyer continues until suddenly the Destroyer’s body drops to the ground lifeless. Balder’s bargain with Karnilla has been accepted and Sif’s soul returned to her body. Thor is transported first to Asgard and then to Karnilla’s castle. She begs Thor to help Balder in his fight with Ulik, something he is of course more than willing to do. The battle is a fierce one and Thor does find away to vanquish the hated rock troll. Everyone is happy except Loki, who has found a way to steal Thor’s hammer in a story that will be continued next issue. As you can see by these eight issues Thor stories rarely ever come to an end. The seven part Inhuman origin story comes to an end here as well with Triton surviving his experience with humans, and providing an ominous warning for Black Bolt that humans would destroy the Inhumans if they were discovered. Listed below are the 47th Overstreet Price guide prices for the books reviewed in today’s Arcs & Runs. 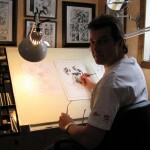 The Overstreet prices seem to be reflecting increased demand for the origins of the Inhumans. 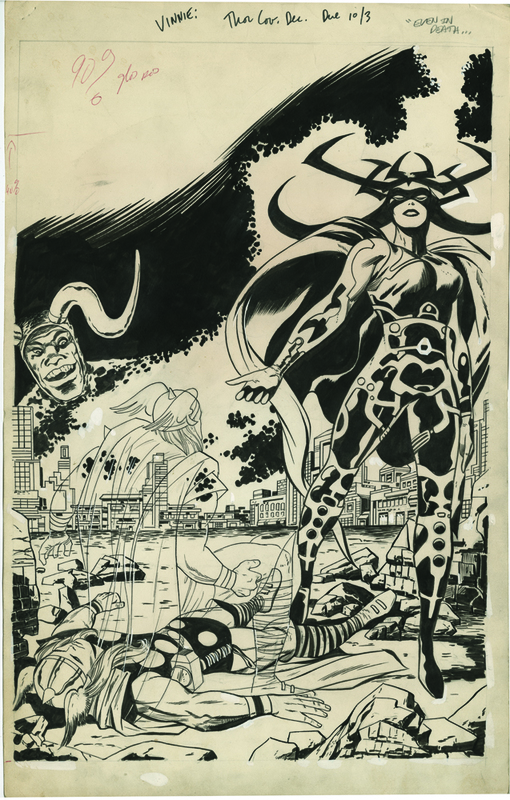 The first appearance of Hela Goddess of Death does not appear to be taken into account at all. She is the “big bad” villain in Thor’s movie this fall and this book may see a boost here in the short term. Issue #150 also features a pretty cool cover and the best of this run IMO. We’ll be back with more Kirby next week. 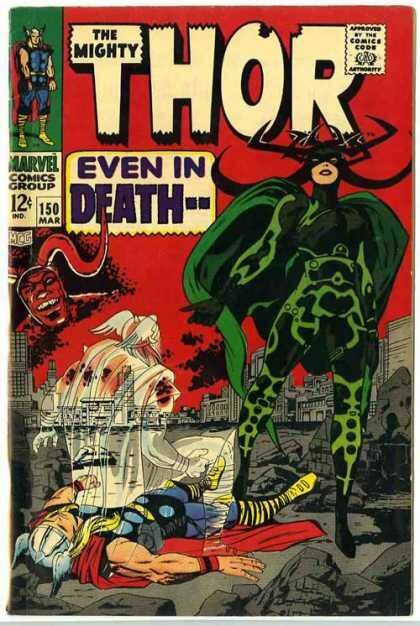 There was some of the most unique and inspired Kirby artwork and concepts in his Thor run as well as outstanding covers and splash pages.The cover of 150 is right up there with some of the all time best covers in comicdom.Lets hope we see this scene reenacted in Ragnarok!Kate Blanchett looks stunning as Hela! Totally agree with here Dennis. These books were also super-cheap and pretty easy to find grade for a long period of time ,but are slowly creeping in price. Kirby’s work on this run and the next twenty-five issues is pretty sturdy stuff. I hope to get some of these books further down the road. Can’t wait for Ragnarok. I think Ms. Blanchett looks dazzling in any part she plays, well maybe not Bob Dylan!